World Ranger Day is observed annually on the 31st of July, and is promoted by the 63 member associations of the International Ranger Federation, by our partner the Thin Green Line Foundation, and by individuals who support the work of Rangers and the IRF. Here below we report the main contents of the Thin Green Line Foundation’s Cover Letter written by its Director and also President of the International Ranger Federation, Sean Willmore. “The 31st of July is World Ranger Day and it is a time for us as rangers and for the world to reflect on many aspects of the ranger’s work and life. We honour and remember those park rangers who have lost their lives in the line of duty. We reflect on progress made, and obstacles still to overcome. And we celebrate the bravery, tenacity and dedication of those rangers who give their all in the service of nature. This past 12 months 52 Park Rangers that we know of lost their lives in the line of duty. Many died due to accidents and more at the hands of poachers and militia. This number is a reduction on the previous several years since the deaths were recorded. And whilst this might be seen as progressing in the right direction, it is little consolation to the 52 rangers’families, friends and colleagues. We must to even more to better train equip and protect nature’s protectors – our park rangers. 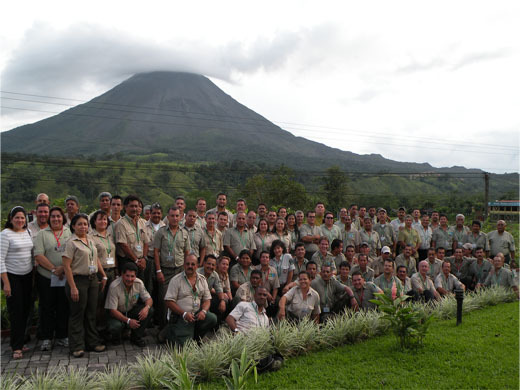 Recently rangers were also honoured and highlighted at the IUCN World Parks Congress with over 280 rangers representing 50 + countries. This included: an International Ranger Station that became a focal point for many; key note addresses; and a heartfelt closing ceremony recognizing rangers who’s lives were lost as well as celebrating our deserving and inspirational award winners. We thank our partners IUCN, Parks Victoria and Patagonia for making this possible. The rangers are also self-­mobilizing, many with support of their organisations, with new ranger associations being formed and joining the IRF, and with many more to come on line. We have, ourselves, also been able to support more than 25 ranger projects in 17 countries and 6 continents, and we are pleased to see a great deal more government leaders and NGO’s increasing their support for rangers on the front.